Farah Khan is one of the very few directors currently working in Bollywood who is making our kind of masala movie. 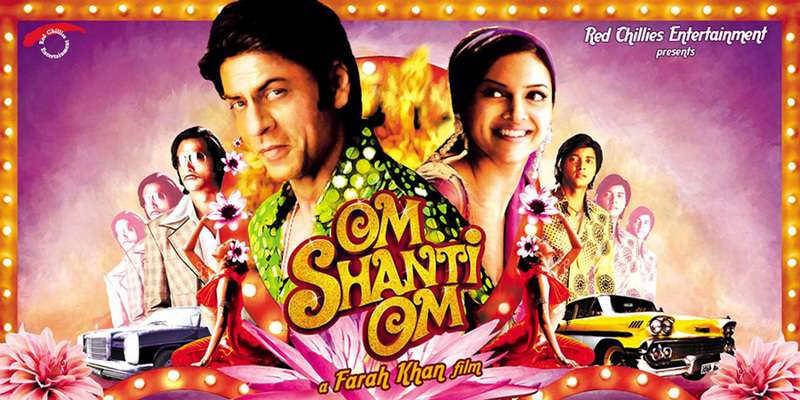 We loved Main Hoon Na and since her next project, Tees Maar Khan, is about to release it seems fitting to start our Christmas silly season with one of the last great masala films we saw in the cinema – Om Shanti Om (OSO). SRK plays Om Prakash Makhija, a junior artiste who, along with his friend Pappu (Shreyas Talpade), is struggling for work in Hindi films in the seventies. The film opens with a wonderful take on Rishi Kapoor’s Om Shanti Om from Karz which foreshadows the reincarnation romance drama musical about to unfold. There is some clever use of the original footage and we felt right from the beginning that we were going to love this! The retro setting also lets Farah Khan and Red Chillies show off some fab CGI work in their tribute to past filmi legends. Om falls in love with one of the big stars of the time, Shantipriya or Shanti, played by Deepika Padukone. Naturally, since this is after all Bollywood, such a romance is destined to face obstacles, as Shantipriya is a big star and Om is a nobody. There are some wonderful scenes where Om woos Shanti, both heart-wrenchingly romantic and hilarious, particularly the scenes when he pretends to be a Southern Indian film star breaking into Bollywood. This was fun at the time, but even better now that we have had the opportunity to see where Farah took her inspiration from! Shanti is secretly married to sleazy Mukesh Mehra (Arjun Rampal) and this of course presents both a barrier to Om’s happiness, and a great opportunity for some excellent SRK emoting. 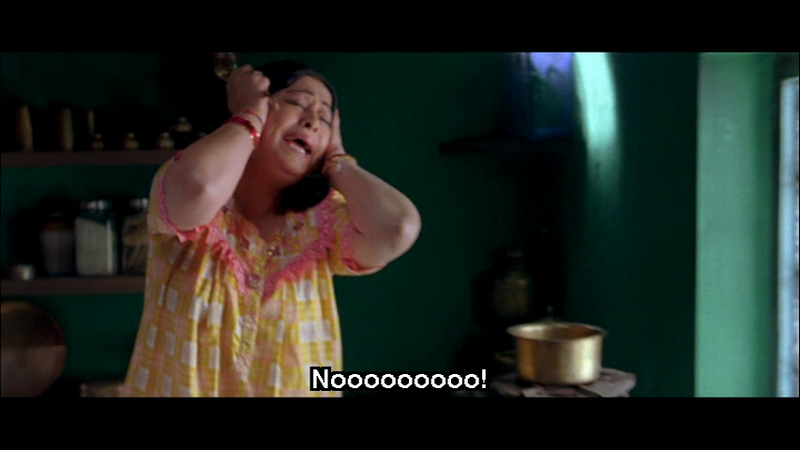 Inevitably, Om discovers Shantipriya’s secret and his heart is broken. Again Farah Khan manages to take some poignant moments and intersperse them with some classic filmi devices to make the resulting song both sad and funny. Since Om is the hero, he still fights to save Shanti when Mukesh determines she must die to protect his own career. Om is badly injured in the confrontation and dies (eventually) in a nearby hospital, at the exact same time as big star Rajesh Kapoor’s wife is delivered of a son. A son who has a mysterious birthmark that looks a lot like a significant tattoo. Yes! This baby grows into Om Kapoor; a spoilt self-indulgent actor resting on his father’s laurels and a trial to all who know him. Adored by his fans, he feels that he can do no wrong until he remembers his past life, grows up a little and resolves to bring about justice for his lost love, Shantipriya. There is plenty of comedy, particularly for anyone who knows something about the films, actors and different factions in Bollywood. There are many sly digs at the industry’s predilection for nepotism, all tongue in cheek and very funny! SRK is not exempt from Farah’s sharp wit: as he arrives for a film shoot, one of the bystanders comments “I thought he’d be taller”. Kirron Kher is in fine form as Om’s ‘filmi’ mother, and she has some fabulous scenery chewing moments. 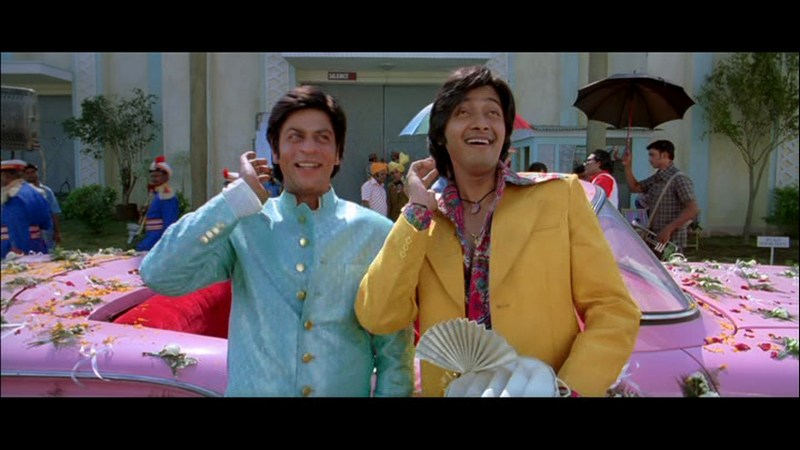 Shreyas Talpade and SRK have some fun scenes together and really seemed to enjoy hamming it up as junior artistes. Although a lot of the humour is contained in the dialogues, there are plenty of physical gags, and even the sad scenes have an element of comedy. While Farah Khan is poking fun at the very typical filmi devices, she is also acknowledging these older films that she clearly loves. OSO is a paean to these masala greats and we were inspired to track down many of the scenes she referenced. There is also plenty of drama. While most of the scenes are deliberately over-acted to get as many laughs as possible, there were some genuinely moving moments. The scenes between Om and his ‘filmi ma’ and his friendship with Pappu were given as much care and emotion as the romantic scenes with Shanti and the confrontations with Mukesh. The film loses momentum a little towards the end, but only for a moment and it soon picks up the pace with the final Andrew Lloyd-Webber inspired showdown. 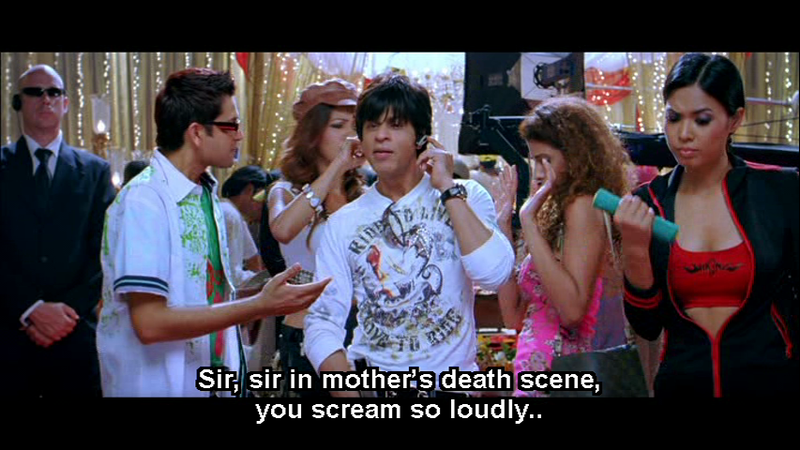 The entire film seems to have been written to display SRK at his best. He brings every nuance of the role to life and manages seemingly effortlessly to turn scenes from happy to sad to totally ridiculous and have us following along accepting every ridiculous turn of the plot. This was Deepika Padukone’s debut film and Farah Khan seems to have gotten much more out of her than any directors since. Although she is wooden in her earlier scenes as Shantipriya, she suits her modern day character of Sandy better and she comes to life in the songs. The support actors, in particular Shreyas Talpade and Arjun Rampal are well cast in their roles. Being a Farah Khan film, of course the songs are exceptionally well choreographed and filmed. One of the things we appreciate Farah for is her determination that her leading men should be objectified as much as, if not a little more than, the glamorous heroines. She outdoes herself with Dard-e-Disco which has hilariously bad lyrics (apparently she kept telling Javed Akhtar to make his lyrics worse) and is full of gratuitous shots of SRK in, emerging from, and being doused with, water. Any good masala film must also have great costumes, and OSO delivers in this regard. The outfits from the 70’s are thoroughly of their period and stunning in their garishness and we loved them. Shantipriya wears some beautiful clothes and the depiction of Om as an actor means we get to see him in an array of costumes. There are plenty of fight scenes too, with the best reserved for the Southern Indian film episode. Much of the film industry seems to have got behind Farah with her multi-starrer song Deewangi Deewangi. It was a fantastic feat to get so many actors to take part, and we had great fun spotting some of the stars of yesteryear and their signature moves. The satire on the Filmfare awards was partly filmed during the actual ceremony and it is very good humoured of both Filmfare and the array of famous actors to take part. We weren’t quite so enamoured of Bappi Lahiri’s singing on the red carpet but he is a legend in his own blinged up disco way. Temple says: This film is like the very best kind of Easter Egg hunt. Everywhere you look there are sparkly little treats and jokes, and beautiful tributes to other much-loved films. I really enjoyed the nod to every filmi cliche that could possibly be used, and the cheerful ransacking of seminal images from Hindi films of the past. I also loved seeing Pyarelal back up in the credits and on the red carpet! The performances really were very good, from the headline stars to the smallest special appearance and I felt that all the performers shared a love of the 70s film industry and it’s products, so they seemed to give it their best. For all the cheesy fluff, the film-making team also did a very intelligent thing with the Om Shanti equation in the modern era by not making it a romance. Om had no intention of, um, completing his earlier relationship with the newer model, just of seeing justice done for his past life’s true love. It made me a lot more willing to sit through repeated viewings of the slightly draggy second half as there wasn’t that squick factor. I also enjoyed seeing SRK revel in his ability to portray unpleasant characters – he was cold, calculating and quite repellent as OK in some scenes, and got to use more than his lauded five expressions. Farah Khan has great attention to detail and everything from the costumes (where on earth did they find all those fabulous fabrics?) to the music suited her vision perfectly. And the now trademark exuberant closing credits were a perfect finish to a great journey and sent the cinema audience out on a high. I loved being swept up in this, and feeling that little bit clever for recognising some of the references. Would you appreciate this film if you knew nothing about its source materials? Yes, I think so. It has so much colour, energy, heart and humour that there is something for everyone. Well, no machetes but I can’t really begrudge that tiny lack. And I was certainly inspired to go find or re-watch some of the classic scenes pilfered for use in OSO. Farah Khan as brand ambassador for Masala Pradesh? She’s got my vote! 5 stars! This entry was posted in Bollywood and tagged Arjun Rampal, Bindu, Bollywood, Deepika Padukone, Farah Khan, Hindi, Kirron Kher, Shah Rukh Khan, Shreyas Talpade, SRK, Vishal-Shekhar. Bookmark the permalink. Just out of interest and relating to your comment re Deepika Padukone and her comparatively better performance with Farah Khan as her director… In a recent episode of Koffee with Karan (I just can’t help myself), when Farah Khan was asked to rank actresses in order of talent she rated those listed by Karan in the following order – Kareena Kapoor, Priyanka Chopra, Katrina Kaif, Sonam Kapoor, Deepika Padukone. When Karan made the comment about Farah ranking Deepika last even though she had debuted in one of Farah’s movies, Farah replied that she had seen her other films since. So I’m guessing that she is less impressed with Deepika’s acting potential than she initially was. She did follow up and say that Deepika had acted well in Love Aaj Kal but at the time she was sitting next to Imtiaz Ali so it was unclear whether the comment was a concession to his directorial ability or Deepika’s acting ability.